Parlee Cycles is happy to announce it has begun shipping the new for 2010 Parlee Z5. The Z5 is Parlee's latest frameset - and one of the lightest frames around- weighing in at around 800 grams- and truly embodies all of the hallmark Parlee traits of lively road feel, comfort, fit, light weight and durability. The bike is also available in an industry leading 10 stock sizes with Parlee's unique Flex-Fit® system. The Parlee Z5 represents the next logical step in Parlee's line of bikes and combines the best qualities of Parlee's Z1 and Z4. Optimization of areas of the seat mast, dropouts, and lay-up schedule yields (on average) a 140-160 gram weight savings over our previous generation Z4 while increasing BB rigidity and ride comfort. Bob Parlee, Owner and Designer of the new Z5 stated, "We are very excited to bring the new Z5 to market for 2010- it is the next step forward from the Parlee Z4 in terms of performance, and showcases all we have learned in the past with our Z4 and our custom bikes all wrapped up in a great package." 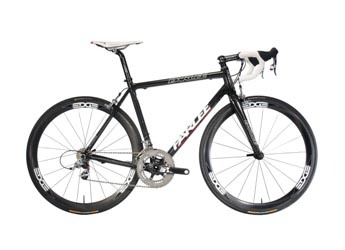 The Z5 joins the Z1, Z2, Z3, Z4, TT and TT Custom, Tour, And CX models for 2010. The Parlee Z5 is available in 10 stock sizes and has a suggested retail of US $3900 for frameset. Please see www.Parleecycles.com for complete model listings.